1) Life's challenges are not supposed to paralyze you, they're supposed to help you discover who you are. 2) You must do the thing you think you cannot do. 3) Our greatest glory is not in never failing, but in rising up every time we fail. 4) Mountains cannot be surmounted except by winding paths. 5) It’s not whether you get knocked down. It’s whether you get up again. we're taking the rest of the week off - happy holidays! We'll be back next week with more tips and advice. In the meantime, please check out our earlier posts for support and information. This time of year it’s all around us: holiday music. From shopping malls to television to our computers, we’re bombarded by holiday tunes and jingles. If you’ve recently lost your partner, these seasonal tunes can stir up happy memories as well as tears of remembrance. Because it’s everywhere, holiday music and the bittersweet recollections that bring on tears are hard to avoid. Rather than fighting it, we suggest you try to “go with the flow” and, in the privacy of your own home, allow a few tears. By giving yourself permission to grieve, it will be easier to get on with some of the pleasures of the holiday season. In Part 2 we covered various strategies for gaining a sense of control in party situations. At family gatherings, everyone will be aware of your loss. They may feel awkward about making any mention of it out of fear of "upsetting" you. In truth, you may actually feel more hurt and upset if everyone is avoiding the subject. In addition, not talking about the person everyone is thinking about only creates more tension at a gathering. Others will take their cue from you. It’s helpful, therefore, at a point most comfortable for you, to mention your spouse in whatever way you wish. You might, for example, bring up the name as part of a toast or prayer at dinner. Even casual comments such as: “Gee, Jack always loved Aunt Rose’s apple pie,” or “Remember how Connie couldn’t wait to start decorating for the holidays?” are effective ice breakers. Please share any of your own strategies for coping with these situations. In Part 1, we talked about taking some steps to be emotionally prepared before you attend a get-together. 1) Giving yourself the first 30 minutes after you arrive to adjust to the circumstances. Remember that without your spouse/partner, this is a new situation. Expect some brief uneasiness. Many discover that once they’ve made it past the first half hour, they’re more relaxed. 2) Contacting the host or hostess ahead of time to explain that you aren’t your usual self and may wish to leave early. 3) Taking your own car or alerting a friend who’s driving you about the possibility of making an early exit. 4) Giving yourself a ‘time-out’ in the event of feeling overwhelmed, so you can retreat to the privacy of a bathroom or bedroom, or take a walk, and have a brief cry. Most people will understand. In Part 3, we’ll cover how to break the ice about your loved one when others are uncertain about mentioning the loss. 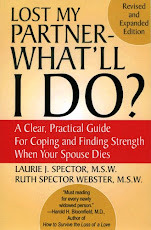 Excerpted from our book, Lost My Partner – What’ll I Do? Revised and Expanded Edition, here are some proven strategies for making it through festive gatherings, even when you aren’t feeling in the holiday spirit. In Lost My Partner, we add, “Even when you’ve prepared yourself by making time to grieve beforehand, you may feel anxious about becoming uncomfortable in a festive gathering. There’s often a sense of being “out of it”, as you watch others having a good time. In Part 2, learn the best ways to gain a greater sense of control in these situations. Here's useful tips on handling an uncomfortable holiday dilemma. You may receive some holiday greetings that still include your spouse/partner in the address (learn more about the whole issue of being caught off guard by people who don’t know about the loss in our earlier post, Encounters of the Awkward Kind; When Others Haven't Heard About Your Loss). If there are some friends or business associates who haven’t yet heard about your spouse/partner’s death, you may be wondering about notifying them during the holidays. It’s okay to do what feels most comfortable. While some people prefer to wait until the stress of the holidays is over, others choose to include a separate notification along with their customary holiday cards or messages. Not sure how to break the news? In the notification itself, you can give a brief description about what happened. Then add a short update about how you and the family are coping. If you usually send out seasonal cards or messages, you may feel uncertain about doing so this year. For many, this annual ritual is an important part of the holidays, and some may even feel guilty about not sending cards. It's important to keep in mind however, that under the circumstances it's okay to skip this or any other holiday ritual you don't feel up to because you're mourning.